Participants will begin to line up as early as 7:00 a.m. to receive a food box from our food pantry partner. Rose was glad they were getting the extra food items because she was going to be able to feed her grandchildren. 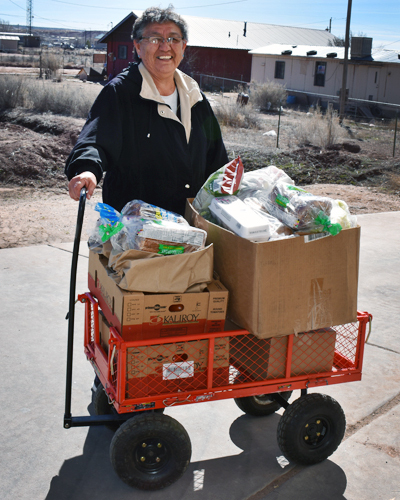 Our Program Partner, Maryline, works with Our Lady of Fatima Food Pantry in Chinle. 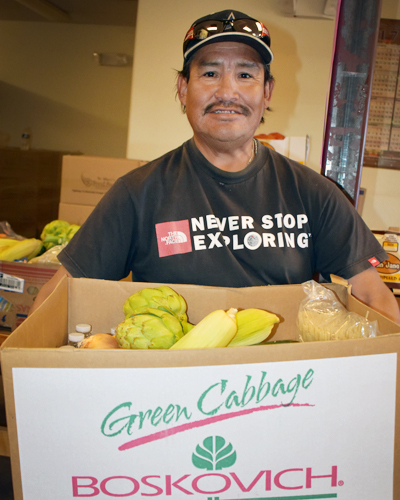 Through the Southwest Indian Relief Council (SWIRC) program, we were able to provide the pantry with a large donation of fresh produce, and we were there to see the distribution in action. 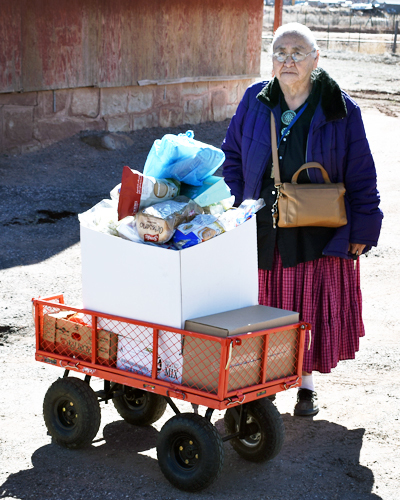 Once a week, the pantry opens their doors to Elders and families to provide food to hundreds of households. According to Maryline, participants will begin to line up at the door as early as 7:00 a.m. in order to receive a food box when the doors open at 9:00 a.m. Volunteers work hard to organize the various items that can be selected. When the pantry is fortunate enough to have extra food, they will open on Fridays as well. Depending on the weather, more than 200 recipients may be served in a day. The food pantry has no covering outside for the people waiting in line, so it is sometimes difficult for people to wait if the weather is extreme. As the distribution, we enjoyed talking to the Elders and families picking up their fresh fruits and vegetables, and everyone had a different story to tell. Rose had been in line since before 8:00 a.m. to collect her food box. She was glad they were getting the extra food items because she was going to be able to feed her grandchildren a variety of items. She was also happy to get fresh vegetables and planned to use the tomatoes for homemade salsa. Lucille has eight members in her family. She said, “Keeping food on the table all month is difficult.” Last month she ran out of food, but was told by the food bank she could only receive one food box a month. This enables the pantry to serve more families in need. This month, Lucille made sure to get in line early for the fresh vegetables. She asked for an additional box of tomatoes and any other items that she could have, as the food would help her to feed the children during the month. Cynthia was glad to be receiving the extra food because her three children were home for a school break. She shared, “The children always want more food. It’s hard to feed them — especially when they are out of school.” She was appreciative of the extra food, especially because they were home all day during the break and not receiving school lunches. Cynthia was familiar with other SWIRC services, namely the Residential service that provided supplies for school dorms and other residential care facilities. One of Cynthia’s daughters stays in the dorm during the school year and has received SWIRC-provided personal care products like shampoo, soap and toothpaste. Johnny just moved back to the reservation and needed nutritious food because of his diabetes. Johnny was a little further back in line and asked us to snap a couple of pictures of him! 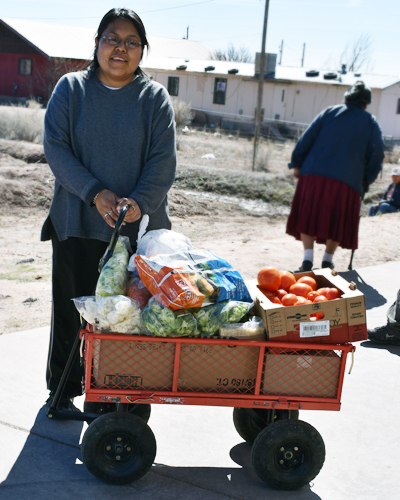 He had just moved back to the Navajo Reservation and needed nutritious food because of his diabetes. Being diabetic, he has to be extra cautious whenever foot or skin wounds occur. He showed us some injuries on his arms that were healing poorly. A small scrape on the skin easily worsens without proper treatment, as high blood sugar typically impairs blood flow to the heart. Even though Johnny was close to the end of the line, he was excited when he heard about all the fresh items he would be receiving — cabbage, corn, zucchini, cucumbers, onions, bell peppers, lemons, tomatoes, eggs, and more — all good for managing his diabetes. A few more people expressed how much they liked the food provided by the pantry and how it helps them to provide for their families. Some shared how helpful it would be to receive the boxes more than once a month and to receive the fresh fruits and vegetables on a regular basis. Even though many in line were tired of waiting, they stayed because they needed the food for their families. It was worth the wait! Thank you for helping us provide fresh produce and food boxes to pantry’s like the one where our partner Maryline works!